Pets feel pain and discomfort under similar circumstances as people. Treatment of pain provides comfort for our furry friends, and helps them recover faster by lessening the stress. We provide post-operative and in-hospital pain management for conditions that require it. Many older pet patients can have painful conditions that go unrecognized and are considered just part of “old age.” It is often found that painful dental or arthritic conditions can cause a pet to lie around more. 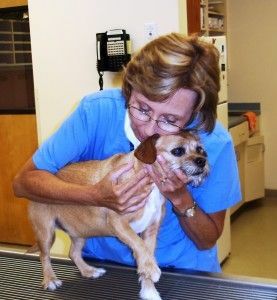 This is really PAIN that can be treated – not just “age.” Proper diagnosis and correct treatment of the cause of the pain will greatly improve your pet’s well-being and quality of life. We strive to offer both natural and medical pain management using modalities such as Therapy Laser and nutritional supplements as well as medications correctly prescribed. We also manage post operative pain and painful medical conditions.